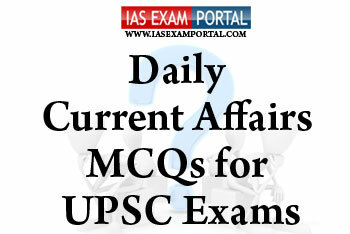 Current Affairs MCQ for UPSC Exams - 17 JANUARY 2019 | IAS EXAM PORTAL - India's Largest Community for UPSC Exam Aspirants. Q1. Which of the following statements regarding the recently released reports of the Annual Status of Education in India (ASER) are true ? 1) More than half of Class VIII students cannot correctly solve a numerical division problem and more than a quarter of them cannot read a primary-level text. 2) It found that enrolment is increasing and the percentage of children under 14 who are out of school is less than 4%. 3) The report also highlights the gender aspect of enrolment, with the number of girls falling sharply with age. Q2. With respect to the recently launched SANJHI –MUJH MEIN KALAKAR campaign , which of the following statements are true ? 1) It is an initiative to document and promote the Intangible Cultural Heritage (ICH) and diverse cultural traditions of the country by direct public-participation. 2) This is a unique talent search where the participant will showcase their talent in the fields of music, dance, drama, puppetry, folk and tribal arts, culinary skills, painting, sculpture etc. 3) The Sahitya Akademi is the nodal agency of the Ministry of Culture, Govt. of India to coordinate the matters related to Intangible Cultural Heritage and various UNESCO Conventions. 1) As per convention, the seniormost IPS officer of the state is appointed as the DGP. 2) But as per the supreme court order, proposals for the appointments should be sent to the Union Public Service Commission (UPSC) that would shortlist the names. 3) The DGP of states can be removed only in the same manner like how a high court judge can be removed. Q5. Which of the following countries of Central Asia do not share a boundary with Uzbekistan ?